The Oasis brings a new level of comfort to Pride’s Infinity Collection. 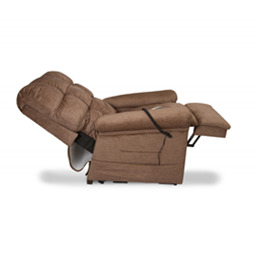 Overstuffed padding provides elegant comfort and design, while contoured seating and pocketed coils deliver individualized support and relaxation. 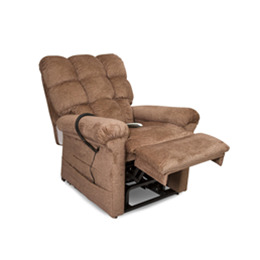 Features include Infinite-position sleep recline, “Zero gravity” and Trendelenburg positioning, unique quad pocket design for extra storage and an easy-to-use hand control with USB charger port. 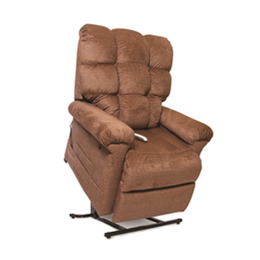 This LC-580 Lift Chair is available in a wide variety of fabrics including, but not limited to: Ember, Field, Oat, Deep Sky, Timber, Buff, Fudge, Garnet, Nile, Pecan and Raven Wing. Seat to Floor: 20" - 21"
Seat Depth: 20" - 22"
Seat Width: 20" - 22"
Top of Back of Seat: 27.5" - 28"
Distance from Wall: 29" - 30"
Overall Chair Width: 37" - 39"
Chair Weight: 130 lbs. - 132 lbs.